A few weeks back I had some issues with my oldest Lucas who is 4, almost 5. He was wetting himself at school. He had never done this before and ok, the first time I thought maybe he was busy and didn’t want to go to the toilet, so I let it slide. The teachers hadn’t noticed so he had been like this for some of the day at least, this had bothered me. Then the next day he was the same. I tried talking to him, finding out if someone was bullying him, saying something, he didn’t want to ask the teacher, etc but was getting no where. In fact it was getting worse as he was saying what I had asked him back to me a few hours later like someone had said something when they hadn’t. It was difficult to find out what was going on. He loved school was happy at school so it wasn’t that, I even asked him if wanted go and he did. I tried the if you stay dry all day you will get X but if you come home wet you want get it. Wrong I know but I was desperate and didn’t know what to do. I’d tried to it’s ok it was just an accident approach but it was happening too often and I wasn’t getting to the bottom of it. So he went to school knowing if you was dry all day he would get something he really wanted. In hindsight this was the wrong thing to do, but at the time I thought it might help. Day three at school, he wet himself again. This time the teacher noticed or should I say one of his friends noticed and told the teacher. Lucas was so upset at the fact he wasn’t going to get X not that he’d wet himself. The teacher explained that we wouldn’t give him a row which we wouldn’t but clearly the bribery didn’t work. He came home in tears. I was at work but my mum called and explained. I called the school but his teacher had left. I was in tears I didn’t know what to do to help him. I spoke to him that evening and he motioned somethings that were happening like the toilets were noisy, people didn’t flush them and one time he was in the door banged open. Things as adults we take for granted as being fine but to a 4 year old this can be scary. I went to see my Aunt that night who is head of the infant department at a large primary school, I thought if anyone could help me it would be her. She told me to go and see the teacher and explain the situation and ask for a buddy to go with him to the toilet. Along with some other pointers on what the teachers were expected to do to keep my child safe and dry. She also explained social stories to me. I had never heard of these. 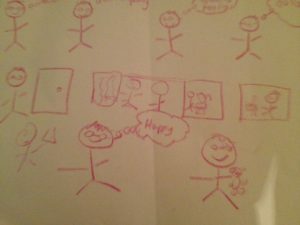 Social Stories are is drawings that tell the child a story and use thought bubbles or talking bubbles on what they should say or think. They don’t have to be professionally done but as long as the child can visualise them it helps. And putting sad faces and happy faces helps a lot. I think they are used quite a lot for children on the Autistic spectrum. I went home feeling a bit better I had a plan. When Lucas got up in the morning, I had my pad of paper and a crayon in hand. It was first thing, it was all I could find. I drew the stick man characters, ok they aren’t great and I got accepted for Art College, clearly I didn’t go to my full potential here but you get the idea. We drew him thinking he needs to toilet, then looking for the bead he needs to go to the toilet, or asking the teacher if the bead wasn’t there, then each step getting to the toilet, etc. Until he goes back to class with a big happy smile on his face and he is thinking happy, because he did it. I also drew a picture of Lucas with his bear as he too makes him happy. I also saw the teacher at 8:30 that morning before going to work without Lucas’ knowledge. We discussed the situation and she agreed she’d ask him if he wanted to go to the toilet regularly and give him a buddy to go with. She was really good about it and he is allowed a buddy to go with him until he decides otherwise. He never wasn’t happy at school but he is a lot happier about the toilet situation and we have had no more accidents. Here’s how I do social stories in a step by step guide. Think about how your child sees the situation, like the toilet at school for example. First I drew Lucas (stick man), then I drew a think bubble and asked him what he thought when he first realised he needed the toilet. He said I need to go, but will wait. I said how about you think, I need to go. In the next stick man, I asked what do you think next? He said I look for the bead. So I put that in the think bubble. The next stick man was thinking I’ll get the bead, (they collect a bead from the wall to go to the toilet.) I said what if there is no bead? I drew another stick man, he was thinking I’ll ask the teacher. The next stick man I drew was walking to the door of the toilet. The door was an issue for him as it banged. Next was the urinal, which was another one which bothered him. He said it was noisy. I drew a picture of him with a smile once he had used it. The next stick man was a picture of him using the cubicle and in the next picture, the stick man with a big smile for having used it. Make sure you ask the child will they be happy or sad once they have done the task. They will get excited and say happy. The next stick man was him washing his hands. I drew the next stick man and put the think bubble and asked Lucas what he was thinking now he had been to the toilet ok. He said Happy. So I added the words happy and put a big smile on his face. 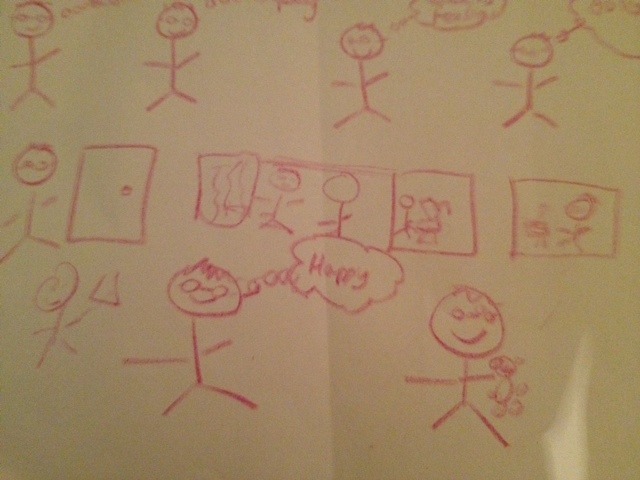 I added a little stick man picture of him and his favourite bear as he told me he made him happy too. Any questions give me a shout. I have used social stories since for other situations and they have worked wonders and the children love creating them with you. I would never have thought to use them but I am glad I know now. I thought I’d let you know about them too. Have you used Social Stories? What would you have done in my situation?